I will bless you in times of mourning with My comfort. In Matthew 5, Jesus shares a kingdom message that we lovingly call The Beatitudes. In this section of the Sermon on the Mount, Jesus reveals some of the values of His kingdom. Nine times He says that people are blessed in circumstances that would seem opposite to what the world system would see as blessed. If you are going through a time of grieving right now, my prayer is that this promise would be very tangible to you. 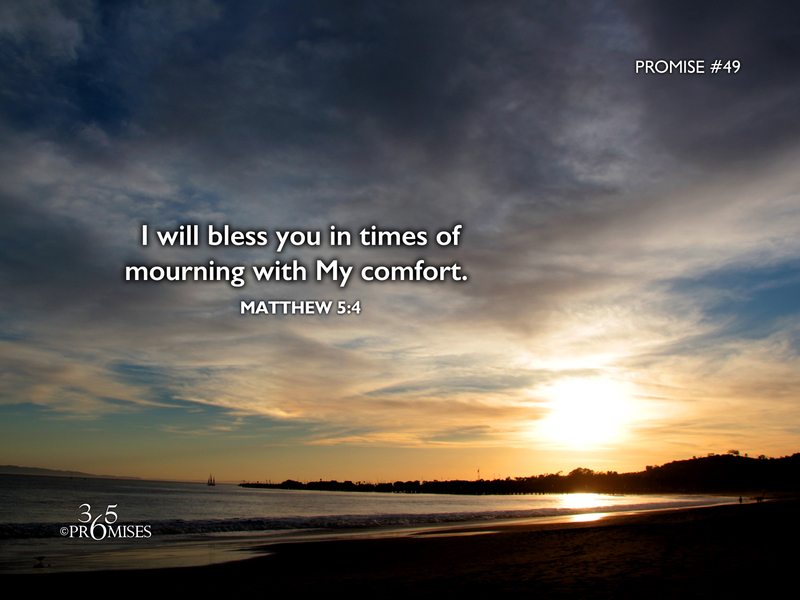 I pray that you would feel God's closeness to you as He carries you through this season of mourning. Through it all, may you truly feel blessed by God despite your circumstances as described by the Amplified Bible... (happy, to be envied, and spiritually prosperous--with life-joy and satisfaction in God's favor and salvation, regardless of their outward conditions).